This is an idea whose time has come again. Recycle this cycle printing idea from the streets of 19th century Paris by strapping a container of some water-based ink to the back of your bike, fitted with a self-inking device, and the streets could be your canvas. I love this idea. It is the latest fashion in moveable type. This tricycle printing sort of reminds me of Jonah Kessel's brilliant invention of his tricycle calligraphy. On the streets of Beijing, Kessel wrote such Chinese proverbs as: Create a good environment for minors to grow up healthy; Virtue shows through long term persistence, civilization reflects by actions; Civilization comes from every individual, to contribute from every little thing. I still marvel at his invention. ::As seen at Ptak Science Books. 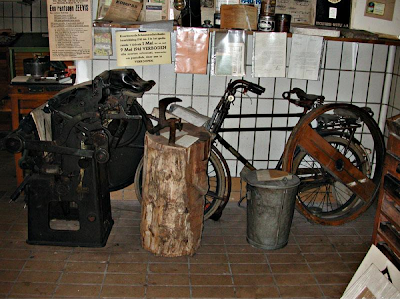 A bicycle-driven "resistance press" from WWII. I believe this press is from the Netherlands where many underground presses flourished during the later stages of the war. It is difficult to see from this lone photo just how this press was operated by the bicycle, but I presume there was a strap-pulley system somehow connected to the flywheel of the press and the press operator fed the paper in the front seen on the left side of image. I read somewhere that Orville and Wilbur Wright once designed and built a printing press and the two brothers ran their own job printing shop for a short while. Eventually they settled on managing a bicycle repair shop and building their own bicycles. Always the inventors, I have to wonder if they ever strapped a bicycle to one of their presses. 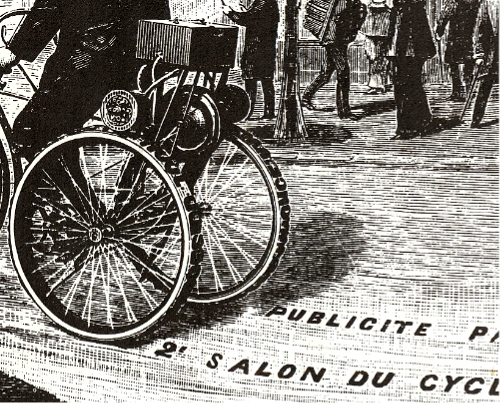 If anyone knows more about this and bicycle-powered presses, please let me know. ::Photo by Krista van den Bos via Bibliopolis. Sorry, but I don't appreciate you advertising your "publication radical stickers" or "top propertied stickers" of any kind on this site. Inappropriate dude!